Improvised bombs planted by Taliban fighters are slowing Nato's big offensive in Afghanistan, military officials say. The BBC's Frank Gardner, in Kandahar, says the homemade bombs have been planted in far greater numbers than Nato had anticipated. Operation Moshtarak - targeting Taliban strongholds in southern Helmand province - has entered its third day. Earlier, the Nato commander apologised after rockets killed 12 civilians. Gen Stanley McChrystal said he "deeply regretted this tragic loss of life" and suspended use of the rocket launching system pending a "thorough review". Our correspondent says roadside bombs have slowed the advance of US troops in the area around Marjah. Insurgents still in the area are believed to be concentrated in Marjah, while those in the British taskforce area of Nad Ali, to the north east, are thought to have either put down their weapons or retreated north. Nato intelligence chiefs believe the Taliban could be holding off attacks for a few days while they wait to see if Nato and Afghan forces are staying or leaving. Nato and Afghan commanders insist they now have enough troops to hold the ground taken and will soon be bringing in hundreds of newly trained police to re-establish Afghan government control, our correspondent adds. Gen Aminullah Patiani, of the Afghan army, said nearly all the targeted territory in Marjah and Nad Ali had been taken, the AFP news agency reported. "All of the areas of Marjah and Nad Ali have been taken by combined forces. They are under our control," he said. "The Taliban have left the areas, but the threat from IEDs [improvised explosive devices] remains." Operation Moshtarak, meaning "together" in the Dari language, is the biggest coalition attack since the Taliban fell in 2001. The operation is also considered the first big test of US President Barack Obama's new "surge" strategy for Afghanistan. Moving into the centre of the town of Marjah on Sunday, US marines and Afghan soldiers came under intense fire from Taliban fighters. Insurgents were believed to be holed up in a nearby compound, so two rockets were fired by a High Mobility Artillery Rocket System (HMARS), a truck-mounted multiple rocket launcher. The rockets, however, veered off course and hit a house about 300m (980ft) from their intended target, killing 12 civilians, according to Nato. It's day three of the joint Nato-Afghan military operation and forces have experienced both successes and setbacks. After inserting thousands of troops by helicopter into Taliban-held territory, Nato commanders say they are so far achieving their military objectives. Meanwhile US, British and Afghan forces are having to cope with an unexpectedly high number of improvised explosive devices (IEDs). For all the hi-tech aerial surveillance, infrared cameras and sophisticated eavesdropping at Nato's disposal, its forces appear to have underestimated the scale of the problem of these roadside bombs. President Hamid Karzai has called for an investigation into the deaths. Ten of those killed were from the same family, his office said. 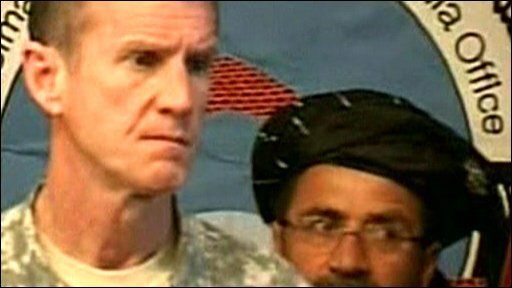 At a news conference on Monday, Gen McChrystal said President Karzai had stressed the importance of protecting Afghan civilians during the operation. "This operation has been done with that in mind," he said. "While this is an Afghan-led operation, I think it highlights the special partnership which we've developed that I'm very proud of. And I would ask the media to watch the bravery of Afghan national security forces and their coalition partners because I'm exceptionally proud of how they are performing." Speaking at the same conference, Afghan interior minister Mohammad Hanif Atmar urged Taliban fighters to lay down their arms and take up the government's offer of reconciliation. "There is no way you can win," he said. Our correspondent says the civilian deaths are very damaging for a campaign aimed at protecting the local population and driving a wedge between them and the insurgents. In the meantime, progress in Marjah is slow and painstaking, and officials say the town may not be cleared out for weeks. US Marines commander Brig Gen Larry Nicholson told the AFP news agency his forces had "blown up a lot of IEDs" and come up against "a lot of sniper fire". He said it could take up to 30 days to make the area safe. To the north in Nad Ali district, British forces appear to be facing less resistance, says the BBC's Martin Patience in Kabul. They have also started reaching out to residents, assuring them of their intentions and hoping to build trust, and to local elders by holding meetings with them and promising to bring large numbers of police, our correspondent says. Operation Moshtarak began before dawn on Saturday when more than 15,000 troops flew into central Helmand. US forces, led by 4,000 Marines, are focusing on Marjah, while 4,000 British troops are in Nad Ali. A large Afghan force, as well as Canadians, Danes and Estonians, is also involved. Three Isaf deaths related to Operation Moshtarak have been confirmed. On Saturday, a British soldier, Lance Sergeant David Greenhalgh of 1st Battalion Grenadier Guards, died in an improvised explosive device (IED) attack, while a US soldier was killed by gunfire in Marjah. On Sunday, another service member was killed in an IED attack. At least 20 Taliban fighters were killed and another 11 detained on Saturday, an Afghan commander said. Another British casualty was announced on Monday, although not connected to Operation Moshtarak. 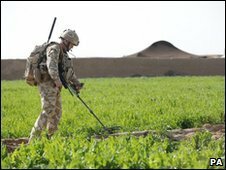 UK officials said the soldier from 2nd Battalion, The Duke of Lancaster's Regiment died during an night-time patrol near Musa Qaleh in Helmand on Sunday. The chairman of the US Joint Chiefs of Staff, Adm Mike Mullen, said Operation Moshtarak had got "off to a good start". "It's actually very difficult to predict [the end]. We have from a planning standpoint talked about a few weeks, but I don't know that," he added. Are you in Helmand province? What will the military operation there achieve? Send us your views using the form below.